Last year Sigma – a user experience agency – evaluated the hidden strategies that some brands used in order to boost sales on their sites during the Christmas period, and this year they have decided to revisit the topic. 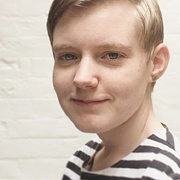 Dark UX describes the practice of designing an eCommerce website in order to trick the customer into buying goods or signing up for services that they do not need, and that they might not want. 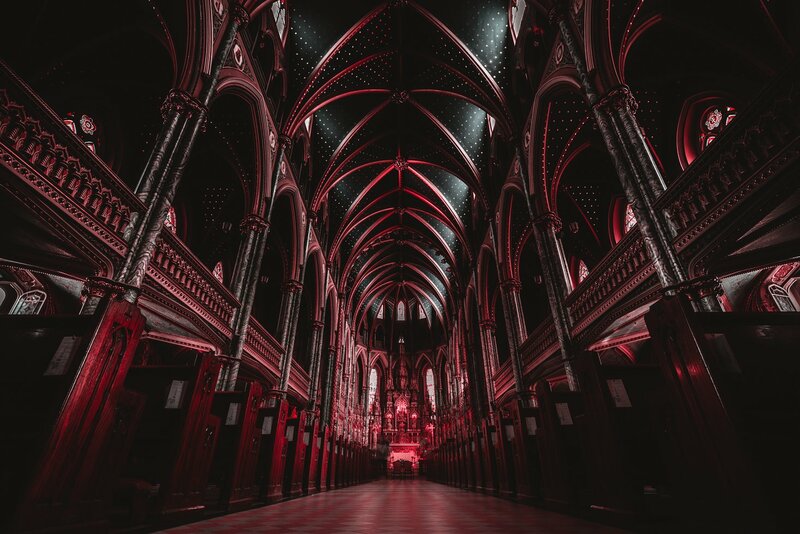 Sites that employ Dark UX tactics are intentionally designed to persuade customers to do what the company wants them to do – putting the brands profits before the customers needs. For those who are tech savvy, Dark UX strategies may seem easy enough to avoid. However, for the elderly and those who are less proficient with a computer or with the language these tricks put them in a vulnerable place, creating confusion and even distress. Amazon gives us a good example of Dark UX using manipulative colour theory. 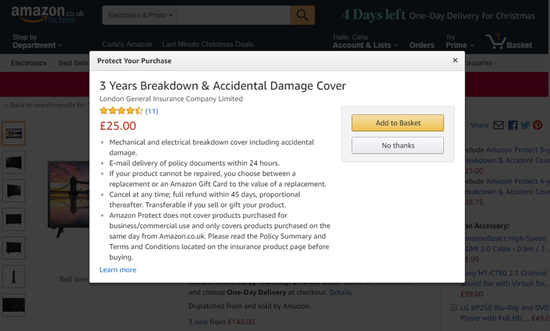 When clicking to buy an item on their site, Amazon does not take you directly to the checkout, instead an unprompted pop-up appears, offering insurance for the selected product. 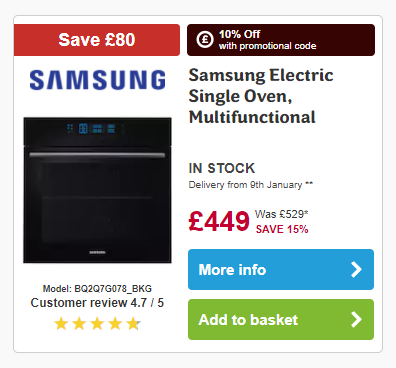 This pop-up uses Dark UX because it is designed to draw your attention to the ‘Add to Basket’ button – which is in yellow and is highly defined – and away from the ‘No Thanks’ button which is less noticeable in pale grey. Amazon featured in Sigma’s previous study, where they were singled out for tricking users to sign up to Amazon Prime, without making it clear that the free trial automatically rolls into a monthly payment. Many charities have also been chastised for using similar tricks, where they design the checkout process to be confusing in order to trick users into adding a donation. 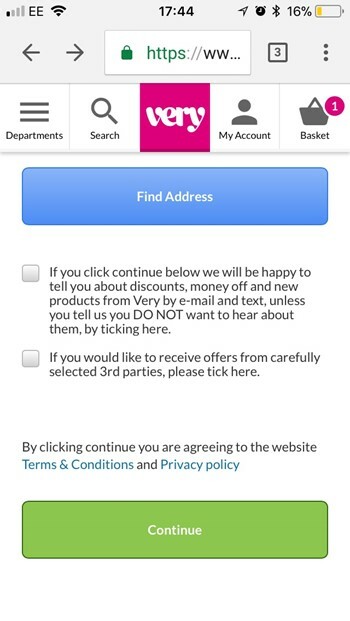 An example of vague micro-copy can be found at very.co.uk, which constructs confusing sentences that use convoluted language to confuse customers so that they join the mailing list. In addition to the copy itself, the two tick boxes require opposite prompts, with one being an opt-in and the other an opt-out, which is another tactic that is used to confuse the customer into doing what is good for the business. Many companies are guilty of creating a false sense of urgency in their customers by using limited duration sales and offers that are highlighted with a countdown clock. However many of these limited time offers are not legitimate. When Sigma visited these sites on multiple occasions the offers were still available outside of the original time limit. This Dark UX trick capitalises on the ‘fear of missing out’, and Sigma’s report highlights fashion retailers Pretty Little Thing and Boohoo for their misleading offers. As well as false time limits, Etsy gives an example of false ‘scarcity’. In order to encourage sales the site clearly states when an item is ‘Almost Gone’ adding that ‘There’s only 1 left!’. 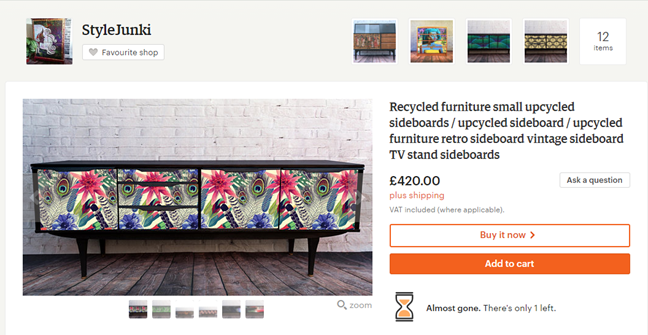 Yet, most items on Etsy are either made to order or customised for each client, meaning that the copy may trick potential customers into making a quick decision about the purchase even though there is no imminent threat of the item running out. Other sites were found to offer further discounts or offers with a promotional code that doesn’t exist, or that is extremely hard to find. For many sites it seems that, in fact, there is no promo code. For those that do provide a code, the site is often designed so that the customer has to work hard to remember and input the code totally unprompted, and, on top of that, many sites are designed so that the promo code entry box is so subtle as to not serve as a prompt. Are you one of the good guys? Subscribe to keep updated.